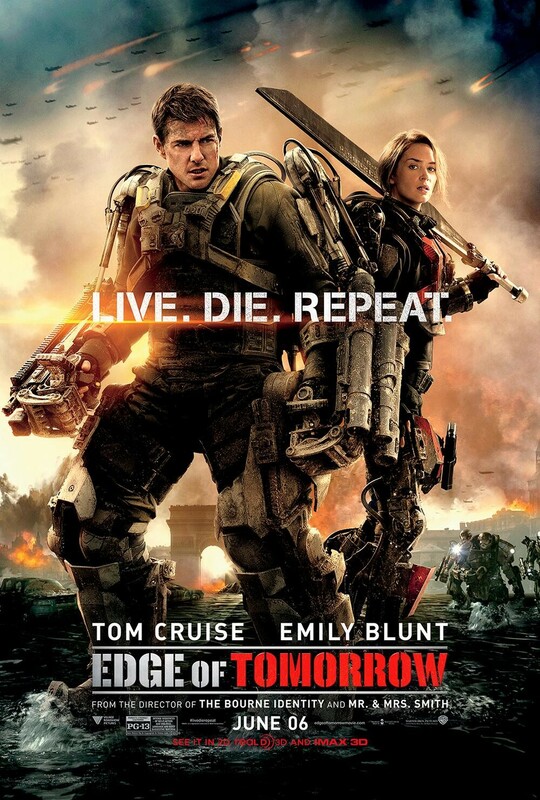 Synopsis: Edge of Tomorrow unfolds in a near future in which an alien race has hit Earth in an unrelenting assault, unbeatable by any military unit in the world. Major William Cage (Tom Cruise) is an officer who has never seen a day of combat when he is unceremoniously dropped into what amounts to a suicide mission. Killed within minutes, Cage now finds himself inexplicably thrown into a time loop forcing him to live out the same brutal combat over and over, fighting and dying again… and again. But with each battle, Cage becomes able to engage the adversaries with increasing skill, alongside Special Forces warrior Rita Vrataski (Emily Blunt). As Cage and Rita take the fight to the aliens, each repeated encounter gets them one step closer to defeating the enemy. Review: Groundhog Day has withstood the test of time and almost two decades later, still remains one of my favourite movies. In my books, it’s no mean feat to be compared favourably to Groundhog Day, but that’s exactly what Edge of Tomorrow manages to achieve – it is essentially a sci-fi version of Groundhog Day, and although it’s a big budget action movie, the film is much better thought-out than the usual mindless summer action flick, and it’s the smaller moments that manages to impress more so than the effects-laden action setpieces. While Edge of Tomorrow falters a little at the start, complete with the used-to-death news montage to set up the story, once the time loop starts kicking in the film becomes far more interesting. Doug Liman has obviously worked hard with the screenwriters to try and figure out exactly how much repetition audiences can take, and much like Groundhog Day, chooses to show only parts of each cycle to prevent audience fatigue. It generally works well, but there are moments where the plot does get lost. What really helps the movie is that it is not shy to inject humour into the proceedings, and indeed that are a handful of sequences that are laugh-out-loud funny, which makes Edge of Tomorrow a better-rounded movie than a typical sci-fi action film. Tom Cruise is excellent as William Cage, mainly because he manages to dial his usual all-in-all-the-time intensity down for the role, and it certainly is refreshing to see him play a coward that dies and gets beaten down literally hundreds of times in the movie. Of course he does eventually blossom into the usual hero character he plays, but present here is at least a progression that is hardly seen in other movies headlined by Cruise. He is ably partnered by Emily Blunt, who is impossibly athletic and graceful in the film, and puts in a mesmerizing and believable performance. The only misstep is the attempt to develop a romantic liaison between the two actors, as while they share a good onscreen chemistry, the romance subplot feels undercooked and unconvincing. And then there’s the film’s denouement, which is surely going to split audiences down the middle. Edge of Tomorrow ends with the usual CGI-laden, guns blazing finale, which really carries very little emotional heft as both the aliens and the cannon fodder are one-dimensional, and audience members are unlikely to feel vested. To avoid being spoilerly, all I can say is that the final scene is sure to throw audiences for a loop, which isn’t necessarily a good thing. Fortunately, the movie has built up enough goodwill along the way that even the head-scratching conclusion is unlikely to derail the positive sentiments. Will Edge of Tomorrow stand up to repeat viewings like Groundhog Day? I don’t think so, but at least the first time round will be fun and rather entertaining.